Pedestrian Detour Plan #2A and 2B go into effect from February 8th, 2019. This plan will affect the small amount of vehicle traffic on Spokane Lane and delivery/shops trucks. 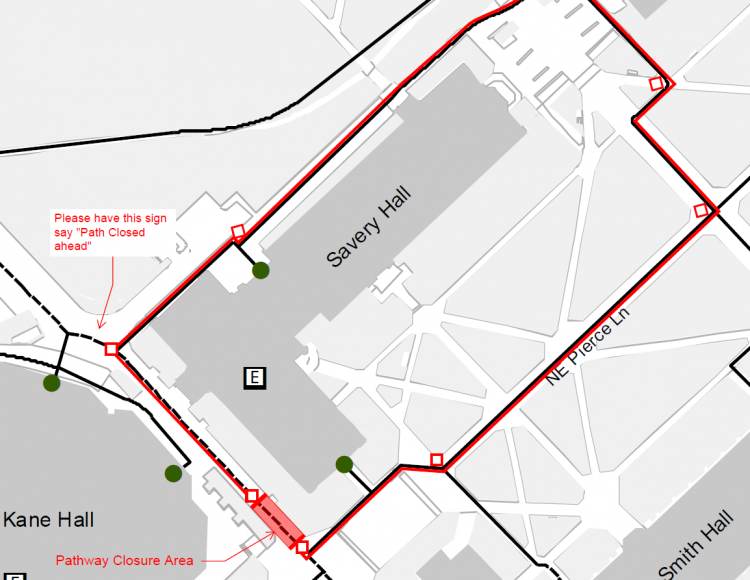 Over the next 3 weeks, scaffolding will be put up on the sides of Savery Hall and the detour should last until to February 22nd, 2019. Several buildings around the quad will be under construction for seismic retrofitting during winter quarter. Foot traffic along ADA-accessible pedestrian paths will start to be impeded on the back side of Gowen starting January 21. Construction will continue and progress to the Savery Hall area at the beginning of February. Additionally, 1 of the 2 ADA parking spots behind Savery will be closed for several quarters during construction, starting in February. Areas affected by this project are shown on the map below. Please plan accordingly if you have classes or activities in this area, and contact your DRS coordinator if you have questions or access issues.